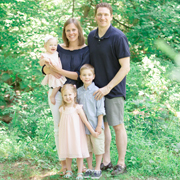 While Nick was relaxing working at the luxurious Bedford Springs Resort the other week, I felt the need to do a little indulging of my own. And so I planned a ladies night in. We discussed Ina Garten and Ben Affleck over red wine and Greek takeout. And then we watched Crazy Heart with slices of spiced apple cake in our laps. 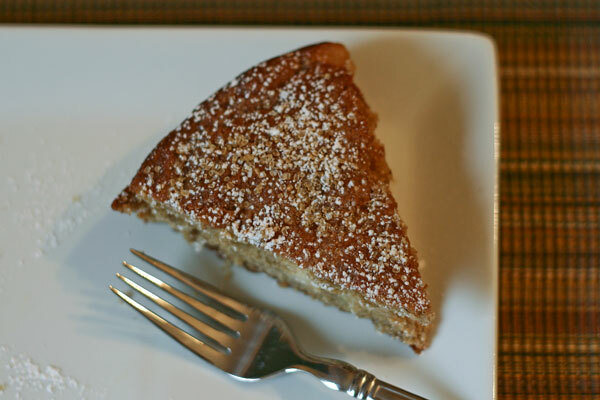 This cake is tart and moist with the sweet crunch of raw sugar baked into the top. I may have had a piece for breakfast the next morning. Preheat the oven to 350° F and place the rack in the center of the oven. Butter and flour an 8-inch spring form pan and set aside. 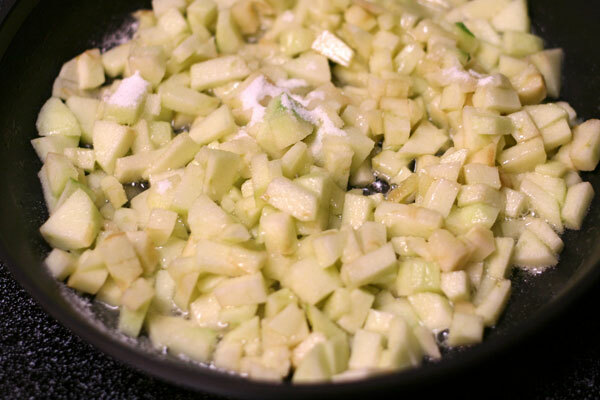 Sauté the apples: Peel, core, and dice the apples into 1/4-inch cubes. Melt the butter in a saute pan over medium heat until butter beings to bubble. Add the diced apples and cook for one minute, stirring with a wooden spoon. Add the sugar and continue to cook for 2 minutes. 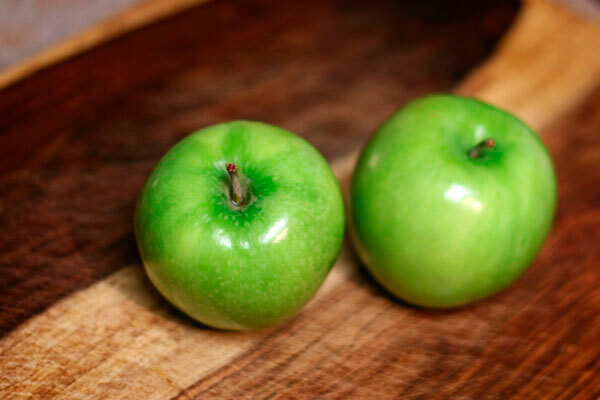 Turn the heat to low and cook the apples, uncovered for 4-5 minutes until they are softened. Remove from heat and allow to cool. Cream the butter, sugar, and spices in a stand mixer until light and fluffy, 6 to 8 minutes. Add the egg yolks one at a time and beat until glossy. In a separate bowl, measure the flour, salt, baking powder, and baking soda. With the mixer set on low speed, add half of the dry ingredients to the batter and mix thoroughly. Add all of the sour cream and incorporate, then add the rest of the dry ingredients and mix until no traces remain. Fold in the cooked apples with a rubber spatula. The cake batter will be thick. Spread the cake batter into the prepared pan and distribute evenly. Take a knife and run it in a singular circular motion through the batter 1-inch from the edge of the pan to help it rise evenly. Sprinkle the cake with the raw sugar and bake for 60- 70 minutes, or until a toothpick comes out clean. Allow to cool for 10 minutes before removing the sides of the spring form pan. 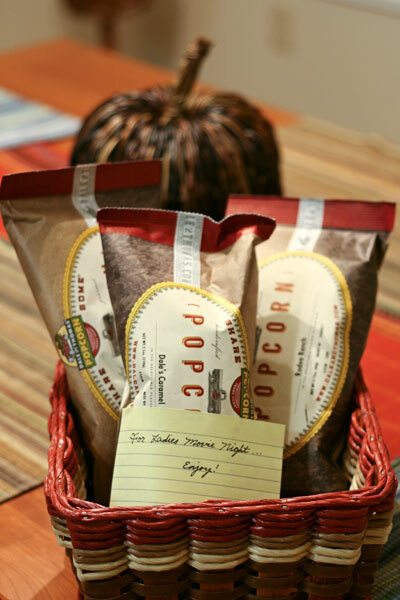 We were too full of hummus and falafel and apples to enjoy the popcorn Nick left for us, but wasn’t it a sweet gesture? 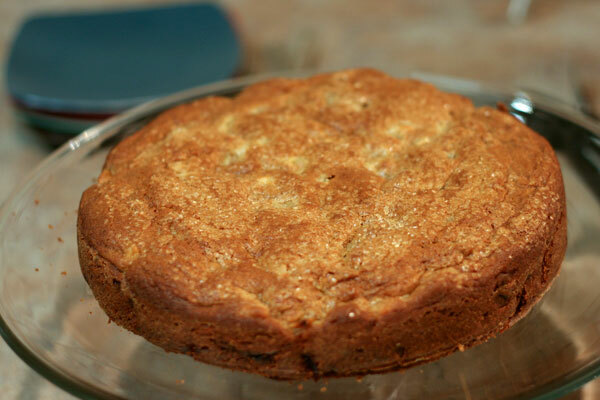 My MIL makes a killer apple cake. I eat it for breakfast whenever possible. Aren’t girl’s nights in the best?! 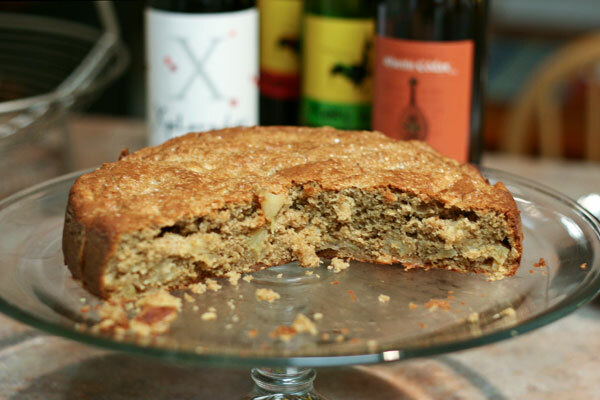 And this is the best time for apple cake – fall weather and apples in season. In my house tho, there would have been none leftover for breakfast the next morning! What a great evening! 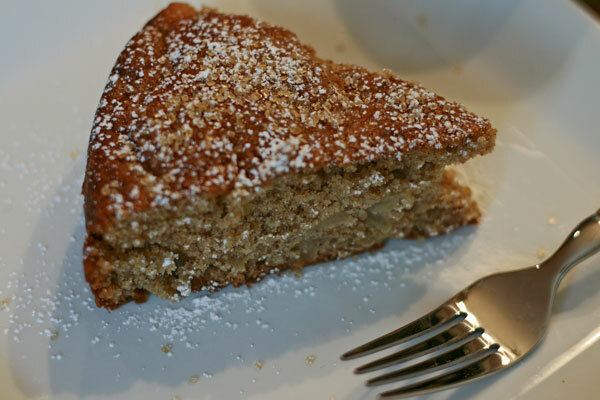 Your apple cake looks yummy. I may have to make it over the weekend to enjoy with morning coffee.